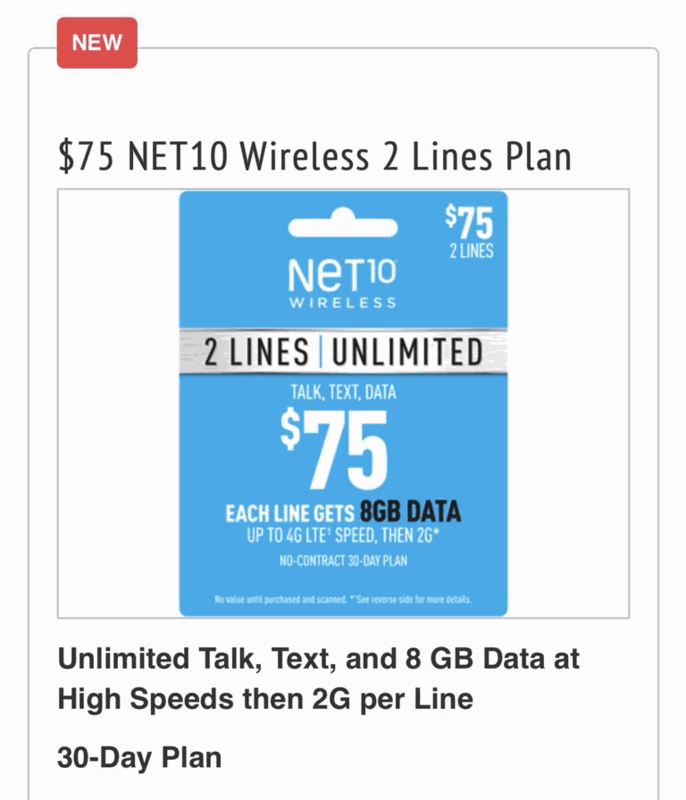 It looks like NET10 Wireless may soon follow in the footsteps of its sister brand Straight Talk Wireless by offering multi-line discount plans. Youtuber Mil Hustles recently sent over to BestMVNO some screenshots of wireless plans that may be destined to launch by NET10. One such plan is a multi-line unlimited plan for 2 subscribers with the first 8GB of data each month at LTE data speeds. The cost of the plan before any possible discounts is said to be $75/month. The high-speed data allotment of 8GB is per line, not shared. Talk and text are unlimited. Besides the $75 multi-line plan, there may be a couple of other plans set to launch by NET10 Wireless. The plans are detailed down below. $90/month multi-line plan - unlimited everything with the first 10GB of data each month at LTE data speeds. $25 Pay Go Plan - 1,000 minutes, 1,000 texts, 1GB of hard capped LTE data. Plan is for 30 days of service. The launch of the 3 new plans is not set in stone. There has been no launch date given yet, and it's possible the details of the plans change. For instance, the $90 multi-line plan with 10GB of data per line does not compare favorably at all to the multi-line plan that is said to be coming from Straight Talk at the same price point. Straight Talk's plan will give subscribers two unlimited LTE data lines for that same price. So perhaps NET10 will update its data allotment for that plan, and the $50 single line plan that it sells with the same features. What's also not yet clear about the new multi-line plans is if there will be an auto-pay discount and what that discount may be. NET10's $50 single line plan is priced at $45/month with an auto-pay discount applied. So two subscribers on that plan would pay $90 month, the same price as what the new multi-line plan is said to launch at. I suspect at the very least a $5 auto-pay discount will be available on the multi-line plan to give subscribers incentive to signup for it. But we may just have to wait for the plan to actually launch before we find out.